« Who will be responsible for the ‘de-gaddafization’ of Libya? Who are the virtual murderers of Gaddafi? Grotesque and hypocrite the new Libyan Government statement on the persecution of the alleged killers of Gaddafi. Stating that these could not have been regular opposition groups and that the new government knows the rules of war… and taking prisoners. “With regards to Qaddafi, we do not wait for anybody to tell us,” NTC vice chairman Abdel Hafiz Ghoga. “We had already launched an investigation. We have issued a code of ethics in handling of prisoners of war. I am sure that was an individual act and not an act of revolutionaries or the national army,” the top interim official said. What a lie, as both NATO and the insurgents – that became the army of the new Libyan government – have thrown tons of munition on any spot they thought Gaddafi would be at a certain moment. A fair trial of Gaddafi has never been on the agenda of neither NATO nor the insurgents, who became the new government. Only the International Criminal Court in The Hague lent itself to suggest that such a trial was a viable option, never protesting in public against the repeated attempted killing of their indicted trial candidates, Gaddafi and his close circle. 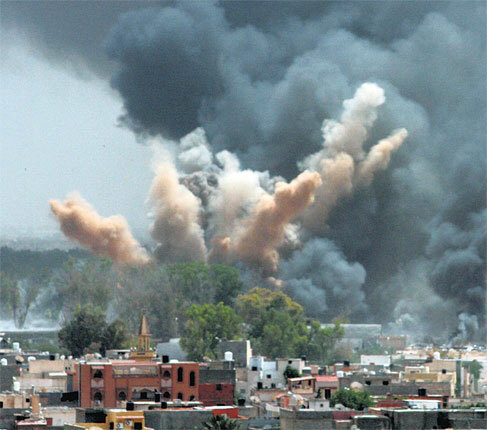 Photograph published in The Independent 2011/07/24 with this caption: "Nato planes bomb a Gaddafi compound in Tripoli last month. Air strikes by allied forces have become increasingly ineffective"
NATO and insurgents were out to kill all those months, but failed in spite of all the high tech devices put to the task. Now a few hot heads – which are necessarily part of any insurrectionist forces – finished Gaddafi’s life by hand, and they will be made into culprits, to wash the virtual bloody hands of NATO and the new government. 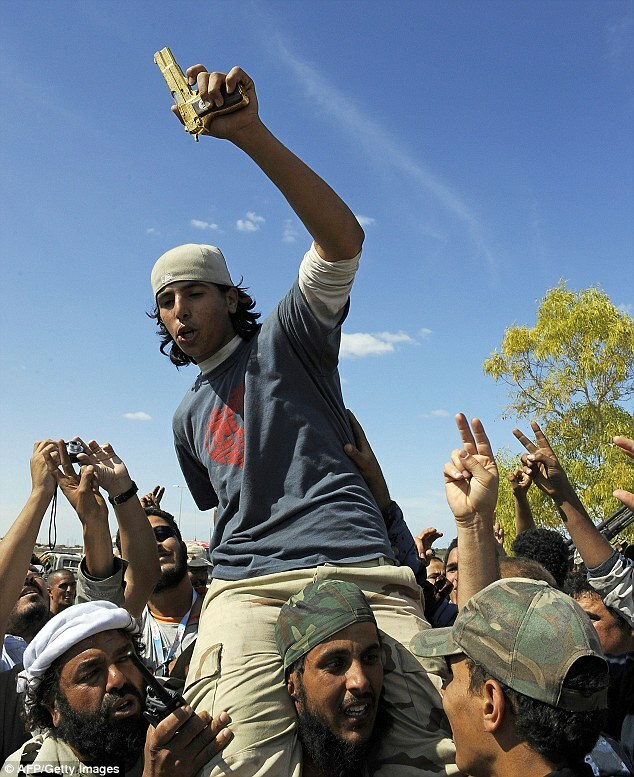 Photograph published on the web site of the Daily Mail 2011/10/21 with the following caption: "Celebration: Rebel fighters carry a young man holding what they claim to be the gold-plated gun of Colonel Gaddafi which was taken from him." It is sad that such distortions of reality are published in the international press without any direct rebuttal. Gaddafi should have been put on trial. His murder will hamper any attempt to cleanse Libya of decades of dictatorship. It is most disturbing to notice that – apparently – distant killing by regular armies using state of the art guided missiles airplanes with remote sensing, and the like, is not conceived as murder and somehow a civil way of getting rid of an adversary, whereas traditional lynching on the spot or firing a gun at a victim at close range is perceived as a barbaric act that can be classified as a crime of war or murder.